Aurora Orchestra aspires to be the world’s most creative orchestra, combining the highest quality of performance with an exceptional breadth of artistic horizons and a trailblazing approach to concert presentation. It seeks to reach new audiences through an outward-looking and collaborative approach to orchestral music-making, built on an unparalleled range of creative partnerships and a consciously omnivorous approach to repertoire. Since its launch in 2005, it has worked with a roster of artists ranging from Ian Bostridge, Brett Dean, Anthony Marwood and Sarah Connolly to Edmund de Waal, Wayne McGregor and Björk. Comprising some of the finest of a new generation of British instrumentalists performing under the inspiring direction of Principal Conductor Nicholas Collon, Aurora has embraced an entrepreneurial and risk-taking approach to programming and concert presentation, overturning preconceptions about what an orchestra should and can do on the concert platform. Resident Orchestra at Kings Place since 2009, Aurora was also Associate Orchestra at LSO St Luke’s from 2010–2015, and in 2016 became Associate Orchestra at the Southbank Centre. Aurora performs regularly at Wigmore Hall, the Barbican and the Royal Opera House (Linbury Theatre), and has appeared at the Royal Albert Hall as part of each of the past eight BBC Proms seasons. In addition to performing a wide variety of existing repertoire (from early baroque music to contemporary masterpieces) Aurora has maintained a particular commitment to featuring new music at the heart of its output. Recent seasons have featured premieres by leading composers including Julian Anderson, John Barber, Mira Calix, Benedict Mason, Alexander Goehr, Orlando Gough, Anna Meredith, Nico Muhly, Julian Philips, Jocelyn Pook, Augusta Read Thomas, Matt Rogers, Martin Suckling and Judith Weir, as well as a rich variety of other contemporary music including major works by Thomas Adès, Steve Reich, John Adams, Michael Gordon and Brett Dean. 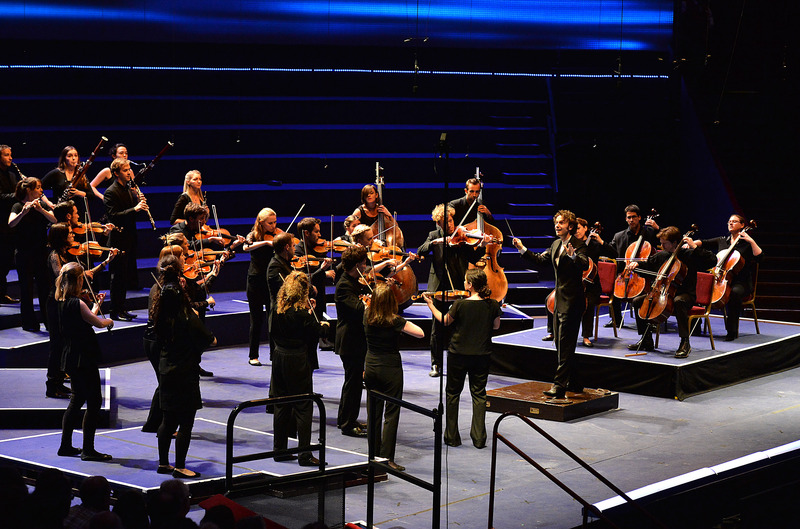 Driven by a commitment to ensure its work is accessible to all, Aurora has also rapidly become one of the UK’s busiest touring ensembles: beyond its three regional residencies (at St George’s, Bristol; Colyer-Fergusson Hall in Canterbury; and The Apex at Bury St Edmunds), recent seasons have seen performances in Aberystwyth, Brighton, Buxton, Cambridge, Deal, Dorset, Dover, Exeter, Glyndebourne, Harrogate, Huddersfield, Malvern, Norwich, Oundle, Oxford, Snape, Southampton, Stamford and Warwick. International appearances in recent seasons have included tours to Bremen, São Paulo, St Petersburg, Shanghai, and Melbourne, the latter as headline classical act for the 2014 Melbourne Festival. With some 80 concerts each year, the orchestra currently performs to over 30,000 people across the UK and internationally annually.